Harvest Lane Cottage: Burden Bearing... Don't Be a Donkey! Let all your requests be made known to God. You need to be like Teflon and let the prayer requests slide through the pan of your prayers and onto Father, Son, and Holy Spirit's plate to make things right and bring healing physically, spiritually, socially, and financially. Now, I must insert here that feeling a burden to pray for someone long-term is not the same as carrying the burden of that prayer being fulfilled. Keep praying, but don't carry the anxiety of the prayer being answered. I really need to remember this right now. My own burden of physical pain, recovery, and the burdens of my children have been heavy on me lately. "Therefore do not worry about tomorrow, for tomorrow will worry about its own things. Sufficient for the day is its own trouble." It's time for me to take it to heart, to really quit worrying about what may happen to me, to my children, to my family. I need to just take it to Jesus, and leave it all. I cannot control it all by worrying about it. Are you burden bearing instead of making your requests known to God? I know I need the second half of that verse. "the peace of God, which surpasses all understanding, will guard your hearts and minds through Christ Jesus." Let's seek him on a deeper level, and trust him more. Thankful for a War Song to Fight This Battle! Is IS hard not to worry - but I try so hard to put things in the hands of God. Only in His time! Faith is my life - without it I have nothing. You are not alone in these feeling. Prayers for your continued healing my friend. Dear Laura, Your post really is speaking to my heart. I have been worrying so much about my Dear Daughter. I pray for her to find her way but I can't seem to let go of my anxiety about the situation. I need to pray to God and leave it all in his hands. Thank you for this timely post. I hope everyday is becoming a better day for you in your healing journey. "You need to be like Teflon"...oh friend...that is perfect. What a lovely, thoughtful post. Sending you much love and hugs. Our pastor preached on Phillipians 4 today, and several other verses dealing with peace from God. How timely to find this on my blog list! God is def speaking to me. OH Laura, so very very true.. I too.. need this . To turn it all over to Him, and to truly Depend on our Father. Sometimes when the load seems heavy.. it seems so difficult, but our Heavenly Father is there ready to take our burdens away [He was there the whole time.. smile].. Hugs my friend in Christ.. Praying for that peace for you and your family.. Praying for complete healing. Hello Laura, it's difficult not to be the burden bearers, especially when we want answers now! I pray that your worry will subside and you will feel His peace come over you. Have you seen the free online study about anxiety starting tomorrow with proverbs 31 ministry? It looks like a good one. So true! I love this post. It's something I need to hear because I do tend to worry about things that are not my responsibility or things I cannot do anything about! I agree with praying--it's leaving the results up to God that is the hard part. I'm getting better with that as time passes. God has shown me over and over that He has things handled, but it's hard for me to let people learn their own lessons/grow in Him/etc. because I always want to fix everything for them and for my problems. I am learning that He is in control, and has the best for each one of us. He continues to show me over and over that he has my best interest in mind and however much I don't like it, sometimes pain is involved. But he always helps me through it. Beautiful post. I came over from Rebecca's blog wanted you to know I am praying for you and your family. Oh thank you Row. You are so kind! This is a beautiful truth you shared today, Laura. Thank you. I have to remember this and have faith. Faith that you were to be healed, faith that I can get my work done, faith that my children remain strong, faith that the world handle the wickedness that consumes many. I also want to have joy in my faith so the burdens don't get me down. Love you. I do my very best to not worry and just give it over for God to handle how He knows best. Thank you for this wonderful reminder! Oh and I love the blog background! Thanks Living... I like that idea. Thank you for this my friend. I do tend to take on everyone else's burdens and I am my own worst enemy when it comes to worrying about the "what might happen". Be blessed and my continued prayers are with you! 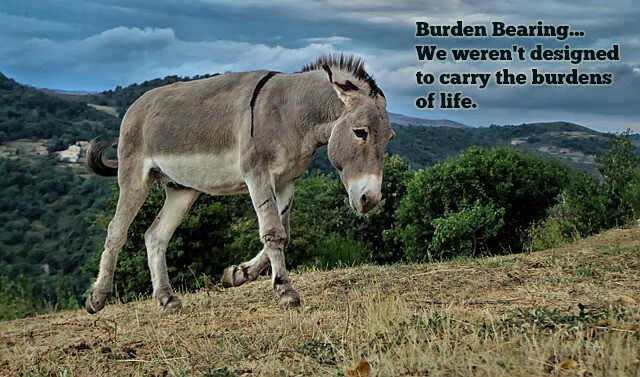 Those burdens we carry can feel so heavy. I love how you describe letting them rest on God's shoulders instead of your own. I have always loved that scripture from Matthew 11, "Come all who are weary..." Life really is simply a balance of doing what you can and then letting go and trusting that it will work out in the end. Have a blessed week!